Archeologists at the historic site of Rabat Tepe, northwest Iran, discovered the fourth cuneiform inscription written with white glaze. Similar inscriptions had previously only been seen in the structure of the Gate of Babylon. Tehran, 26 December 2006 (CHN) -- Continuation of archeological excavations in Rabat Tepe II, located in the Iranian northwestern province of West Azarbaijan, resulted in unearthing the fourth cuneiform brick inscription in Assyrian script. Just like the ones previously found in this historic site, the newly discovered inscription is written with white glaze. According to Reza Heidary, head of the archeology team in Rabat Tepe, the 33x33 square centimeter inscription in the Assyrian language is inscribed on a glazed brick eight centimeters thick and is dated to the first millennium BC. "This discovery shows that some 3000 years ago the inhabitants of the region used white glaze to inscribe tablets in cuneiform script. Prior to this, white enameled brick inscriptions were discovered in the famous Ishtar Gate of Babylon," explained Heidari to CHN. The Ishtar Gate of Babylon was built in the 6th century BC and was the main entrance to the inner streets and temples of Babylon. The foundations of the gate were discovered between 1899 and 1914, including numerous glazed bricks and unglazed figures. 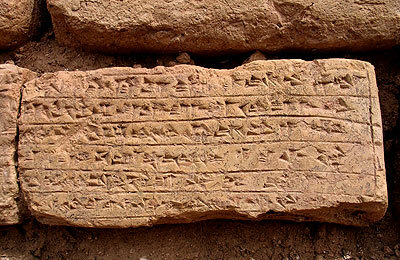 Heidary further said that a team of Iranian graphologists is now busy decoding the brick inscriptions unearthed so far in the 3000-year-old historic Rabat Tepe, hoping that they could shed light on some of the historic events of northwest Iran during the ancient times. "Existence of large numbers of bricks in the region must have something to do with the architectural style of the region. Thus continuation of excavations will for sure lead us into discovering more bricks which would provide more information on this historic site," added Heidary. Rabat Tepe is located near the town of Sardasht in West Azarbaijan province, northwest Iran. Archeologists believe that the hill used to be the center of Musasir Government some 3000 years ago. First season of archeological excavations in Rabat Hill resulted in the discovery of 3000-year-old 180x180 square centimeter flagstones as well as statues of winged goddesses and a naked winged goddess in the region. Such unique findings have attracted the attention of world archeologists to this historic site.